Lewis M. Steel’s recent memoir, The Butler’s Child, was published by Thomas Dunne Books/St. Martin’s Press. He is senior counsel at Outten & Golden LLP, where he works on re-entry cases. 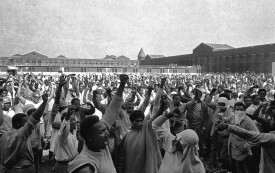 Did the terrible events at Attica lead to a more enlightened prison and penal system? No. The repression, instead, became worse. Carter helped to change America, and helped to change me, along with the many black and white lawyers who worked with him and whom he taught that fighting for equal rights entails risk, patience, understanding and placing the cause before yourself.